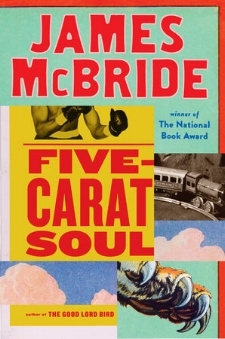 In his most recent book, a stunning collection of short stories titled Five-Carat Soul, McBride illustrates how our common desire for freedom and equality outweighs what are often imagined or prejudice-rooted differences. Set in contexts as far and as wide as a Civil War battlefield to a Washington D.C. zoo, McBride’s stories breathe surprising and refreshing complexities into the simple narratives we are told and tell ourselves about who we are and who others may be. The book begins with a chance discovery by a proud, Jewish antique toy collector named Leo Banskoff. Banksoff happens upon the invaluable Under Graham Railroad Box Car Set, the value of which we learn is “tied to history, naturally, and complicated by time, war, and the unreasonableness and the emotions of a child’s joy and sorrow” (8). While the set originally belonged to the ailing son of General Robert E. Lee, the toy, along with the advanced machinery it contained, fell into the hands of a slave escaping north, inadvertently averting a potential Confederate victory. Centuries later, the long sought-after toy leads the collector to his own surprising discovery at a grimy Brooklyn nightclub while listening to the cathartic rap of the infamous Dr. Skank. McBride’s stories breathe surprising and refreshing complexities into the simple narratives we are told and tell ourselves about who we are and who others may be. The book’s title story opens with a sadly familiar scene: the fatal shooting of an unarmed 17-year-old boy, Buck Boy Robinson, at the hands of an adult claiming self-defence — Mr. Woo — in a part of town known tellingly as The Bottom. We witness the immediate aftermath of Buck Boy’s death through the eyes of a 12-year-old called Butter. He describes how, within days, activists and newscasters descended upon The Bottom after the town's bombastic Rev. Jenkins announces a march in Buck Boy’s honor. “The funny part,” Butter tells us, “is if Buck Boy Robinson saw Rev. Jenkins in his fine pink suit walking down the Boulevard at night, he’d rob him down to his socks no problem” (61). Impassioned and distracted by the ongoing protests he has been busy leading, Rev. Jenkins asks Butter, in an afterthought, where Buck Boy had been buried. Butter points to the top of a hill, where the lone silhouette of Mr. Woo stands in silence. Butter’s nonjudgmental yet revealing account of the murder’s aftermath, much like Five-Carat Soul as a whole, slides seamlessly between the absurd and the tragic. As the narrator lists the names of young men from The Bottom whose common fates were not met with public outcry in the same way as Buck Boy’s, a different list of names — including Trayvon Martin, Eric Garner, Michael Brown, Sandra Bland, Philando Castile, among many others — seem to echo somewhere behind his words. McBride’s story simultaneously displays the complex racial dynamics of a grieving town and reminds us of human lives — however imperfect or noble they may have been — that are transformed into hashtags with tragic regularity. Lastly, in the collection’s most moving story, titled “The Christmas Dance,” a graduate student investigates a devastating and long-forgotten defeat at a World War II battle led by the majority-black 92nd Division. His surprising discovery at Minton’s annual Christmas Eve dance will both move and unnerve you.